If You Need Something...Cut it Off! It’s been nearly two weeks since I decided it was time to say goodbye to my locks. After 7 ½ years I had begun to feel as though they were an integral part of my identity, and though I often questioned what it meant for me to wear them and continued to dream about them falling off or disentangling themselves, it wasn’t until I read this article that I really seriously considered cutting them off. It struck me not only because I felt she made some very valid points, but also because my experience had been so utterly different. When I first read it my mind jumped to justify my hairstyle by arguing that, in many instances, it was the icebreaker that allowed me to listen…it started conversations and connections that I might not have experienced otherwise. It also made people question their first impressions of me, which is something I want to encourage in general, though not at the expense of others. After so many years, each element of my hairstyle also tells a story, from my bangs to the shaved side of my head, and allows me to share a piece of myself with the people I encounter. My hair seems to make me approachable in a way I've never experience before. But then again, so does my dancing. So does my personality. So do my actions, my performance, my travels. But those things take longer to discover than just a glance, and so in all these ways I have continued to justify it even though I often questioned if it was just contributing to systems of oppression and cultural appropriation. It wasn't until I really began to look at my privilege as a white woman that I realized that no matter what the reasoning behind it, there would always be an undercurrent of inequality because I can make the decision to wear my hair this way and not have to worry about all of the struggles and hardships associated with locks when people of color wear them. Yet, I have encountered surprisingly little confrontation or negativity despite my efforts to constantly and openly acknowledge my privilege, actively listen, and engage in conversations about race and cultural appropriation with people from all different backgrounds. I think that's the main reason I have continued to wear them…I've received overwhelmingly positive feedback from people all over the world (not to mention the advice I received while I was in Cuba to be careful about cutting my hair and losing the vital energy it holds as a daughter of Ochun). Given the arguments in the article, this didn’t make sense to me until I realized I had never actually solicited honest opinions from my friends and community, and as my friend and teacher Latisha Chisholm later pointed out,” Cultural appropriation means less and less once people get to know one another on deeper levels. None of your friends will accuse you of anything negative in relation to whatever way you choose to look. That's the nature of true friendship.” But my curiosity was sparked, and though I was already feeling slightly disgusted and squeamish about the things attached to my head and considering grabbing a knife and just going for it, I decided to make myself completely vulnerable and really tackle this thing head on so I could make an informed and non-reactionary decision (thanks for encouraging that Claire). Of course in this day and age that meant putting it out there on facebook and waiting nervously as the responses poured in. And I think exactly that is what stood out for me the most in the article, the fact that I can wear locks and be associated with cultures who have been and still are oppressed without having to bear the burden or face the same consequences they would for doing the same, even though it comes from their ancestors. As my friend Theo put it “...there exists a belief and understanding that nothing in Black culture is exclusive to the people, and also that what ever that Black cultural element is has to be accessible to others simply because they want it…” This dates way back in African History to colonization and slavery, as my boy Diedonne so generously explained to me. Seeing my locks as something I felt like I could just take (even though I did do my homework and do understand the history) because I wanted to, and then drop should they inconvenience me and, boom, it’s all good, made me feel rather sick. “We should all know by now that you shouldn't judge a book by its cover, and that the most important rule is respect and compassion, and yet people who fancy themselves warriors for a noble cause continue to commit the grave sin of allowing symbols to eclipse people. This is the sin that allows for racism and genocide in the first place, so it's a tragic irony when groups who are trying to fight against those things do it! It just needs to be combined with power and it causes people to do the most atrocious things in the name of the good! Look, it's complicated. This article lays out many good reasoned perspectives on why white dreads will be seen as offensive in the context of history and America's racial legacy. I had never fully considered that angle but it made so much sense to me! It’s become clear to me in the past few years that one of the most significant ways I can use my privilege in a positive way is by having the hard conversations with other white people that people of color are already so exhausted from trying to have and not being heard. As twisted as it seems he is probably right that my ability to even begin those conversations was hindered by my appearance. I spent some time alone, with the ocean and the river, and I asked myself and them every question that had arisen and waited for the answer. I offered pieces of my locks to each and watched what they did with them. Yemaya let it float on her calm lapping surface for just a few minutes before she embraced it and tangled it in with her bull kelp, the locks of the sea. Ochun began to take it downstream, floating it alongside the roses I had also offered, and then circled it back around to where I perched on the rock, once. Twice. Three times before the darkness engulfed us and I was forced to wait until morning to have her answer. On the way back my shoe broke and I continued barefoot, the grass and dirt between my toes made me feel more grounded than I had in weeks, and I trusted that I would know what to do in the morning. Upon waking I returned, prepared with knife, scissors, clippers, but still unsure. Ochun had finally accepted my offering. I counted my locks one last time, expecting to find my lucky 37 only to find a mysterious 38th. “I’ll just cut one off and see how it feels”, I told myself. “At least that way I’ll have the right number again.” The knife was dull and it took some work, but the feeling of each hair releasing itself from my scalp was slightly painful but also pleasurably addictive and before I knew it they were half way gone. I cried, I laughed. I rejoiced and I mourned. I did a terrible job with the dullest of tools but when I reached up and touched my scalp for the first time in so many years and looked down at the pile of memories, loves, stories, joy, sadness, and adventure in my lap I knew I had made the right decision. I’m happy to report that I have received overwhelmingly positive reactions to this decision too, but this time it feels more authentic to who I am…it's a whole new kind of social experiment except this time it doesn’t hold the kind of weight that my locks did (haha yes, literally as well). At first I was worried people I didn’t know well wouldn’t recognize me, but that was immediately dispelled the first day I left the farm. But the real test came when I went to the bay and was surrounded by tons of people I didn’t know at all. 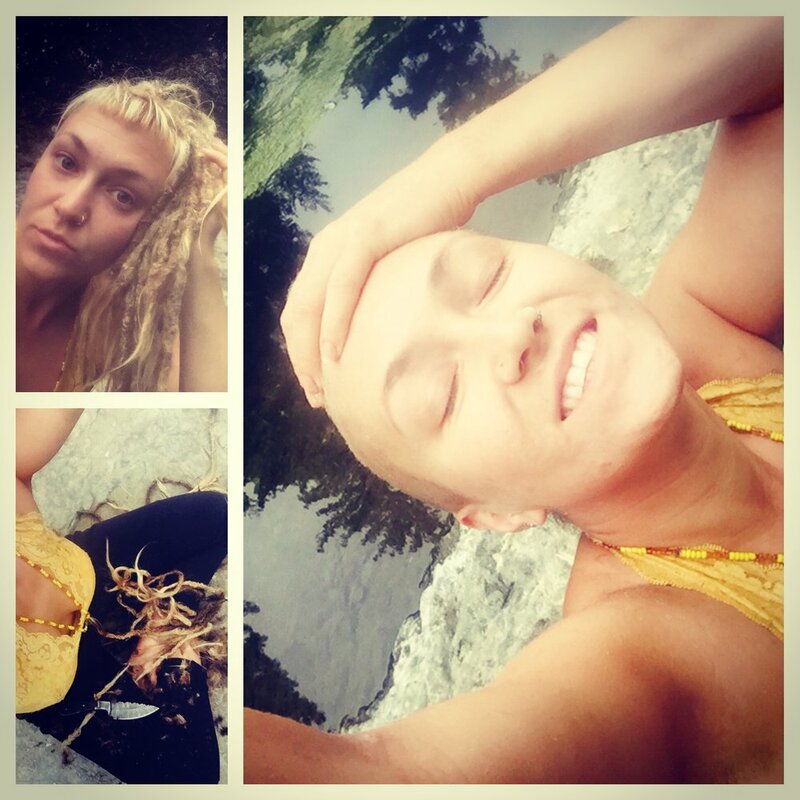 But my fears vanished when I was approached by so many woman who told me they either had or had always wanted to shave their heads, and the conversations that ensued were touching and some of them have already continued to blossom into friendships. It’s always been much harder for me to connect with women, and I had considered that perhaps my hair played a role in that (especially for women of color and all of the history and discrimination surrounding their hair) but I didn’t realize the extent of it until it was gone. Lately I’ve been feeling the need to cultivate more friendships with women and I finally feel like I’ve removed a huge obstacle from my path. I’m just beginning to identify with this new me, and recognize her in the mirror, but I feel like she’s someone I can be proud of and relate to on a whole new level and that is so empowering! Thank you, friends, for supporting me on this journey and giving me the gentle guidance and advice to come to this decision on my own. It means the world.